If you listen to certain people in the recruiting industry, you’d think that being able to leverage information systems for talent discovery and identification will be an obsolete skill for recruiters and that sourcers will have to find another profession in the near future. According to these folks, people with sourcing skills won’t be necessary because the future of sourcing will lie in total automation – they believe that applications that employ semantic search, AI and NLP (Natural Language Processing) will be able to perform the entire candidate matching process for you. However, neither Watson, Artificial Intelligence, Natural Language Processing nor semantic search will be putting any sourcer or recruiter out of a job anytime soon unless all they’re doing is basic keyword and title searching. As I have said countless times before, you should not seek to automate that which you do not fully understand (e.g., human capital information retrieval) and that you cannot accomplish manually. If an organization hasn’t already mastered manual human capital information retrieval via Boolean queries and LinkedIn’s faceted search, then they should most certainly not try to implement a solution that automates candidate matching. Admittedly, some roles and hiring profiles are incredibly easy to match based on most recent title (e.g., accountant, customer service, account manager/executive, etc.) coupled with a few supporting keywords. I’ve used a number of solutions that employ semantic clustering for concept matching and I have to say they do remarkably well for these kinds of roles. Unfortunately for the people who make these solutions and fortunately for some (who make a living off of being able to do what matching apps cannot), semantic and AI matching applications don’t do very well with anything approaching even moderately complex hiring profiles where the best indicator of relevance isn’t easily determined by basic title and keyword conceptual matching. Thankfully, I’ve never had the luxury of being able to find a volume of well qualified and matched candidates by typing in a title or two and a few keywords from job descriptions. I say thankfully because I would not have developed the skill I have now had I started my career in recruiting focusing on roles where basic keyword and title searches allowed me to find a suitable number of relevant results, I would never have developed an interest in human capital information retrieval, and this blog would not exist! My entire career has been focused on higher-level information technology and finance and accounting positions, including those requiring up to and over Top Secret clearances. For these kinds of roles, basic title and keyword searching yields essentially what anyone else can easily find and match with little thought (offering me no competitive advantage), as well as a flood of false positives to wade through. I’m often called in to figure out how to find candidates when all other attempts and solutions – both human and AI – have failed. If an organization’s talent needs can be met solely by basic keyword and title searching, you certainly don’t need people to manually perform the searches, and we don’t need to wait for Watson-level performance because even todays semantic search solutions can take care of this level of retrieval. However, always realize that not all results are created equal, and every search – automated via AI or otherwise – returns some relevant results and excludes some relevant results. Do not be “wowed” by semantic matching applications that can return what appear to be good results – you can be guaranteed that you’re also missing some fantastic candidates, and there is no automated solution for exploring dark matter. I am positive that over time, semantic search/clustering, machine learning, and NLP solutions specifically designed for talent discovery and identification using human capital data will make advancements and their effectiveness will improve. What I am not so sure of is how many jobs will actually be displaced by these solutions. In fact, some new jobs are certain to be created as a result of these applications. Take a look at the emergence of ERP and Business Intelligence solutions as an example. Have applications like SAP or Oracle’s HRMS, Financial and Supply Chain solutions eliminated jobs? Perhaps some lower-level positions, but it is quite clear that they have created a great many jobs, and some ridiculously high level/paying! Some people with highly specialized experience with specific SAP modules can earn over $200/hour – and that’s not just for technical people – it’s for functional experts as well! You would think that multi-million dollar software applications would do all of the HR and accounting work for you. The reality is that these applications don’t do any real “work” themselves. 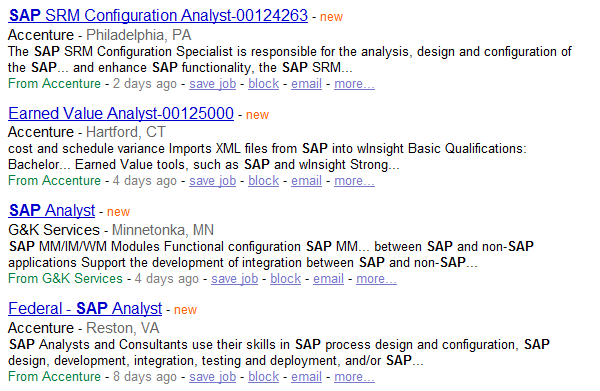 Notice how many “Analyst” jobs come up even though I didn’t search for the term. That’s because SAP applications don’t perform any real work on their own – they store and move data (via reports and such), but people are required to make sense of it. Business Intelligence solutions such as SSAS, Cognos, Essbase, or Business Objects don’t “work” on their own – they require people to configure, use, and analyze the information provided by them. Highly specialized applications require people with the specialized skills and experience to use them, to make sense of, interpret and to make decisions based on the data and information provided by them. Just as with ERP and Business Intelligence applications, when it comes to sourcing and recruiting solutions that use semantic clustering, AI, and NLP – people will be needed to implement, maintain, upgrade, customize and of course actually use the semantic search and matching solutions in production to find top talent. Thinking that a semantic search solution for recruiting will run automatically without some guidance from a power user is like believing that companies can rely solely on the “canned” reports that come with HRMS and Financial ERP systems and Business Intelligence solutions. They don’t – practically no one does! A non-customized semantic search solution that isn’t tailored specifically for the organization and multiple business units using it is essentially equivalent to a “canned” report that comes with PeopleSoft, SAP or Microsoft out of the box. I do quite a bit of work in the Information technology space, and I’ve seen a steady need for well over a decade for people with expertise in creating custom cubes, views and reports using ERP and BI applications. If you think about it, a report is really just a query for the retrieval of information to analyze. Not much different than searching for, retrieving and analyzing human capital data for potential candidacy! Additionally, non-customized semantic search solutions can nullify competitive advantage. If 5 companies who are constantly battling it out for top talent all use the same semantic search application, all 5 companies will find all of the same people. That means no competitive advantage. Perhaps even more importantly, they’ll also be totally unaware of the people their semantic search solution could not find – a common hidden talent pool of Dark Matter profiles that cannot be tapped by any of the companies. 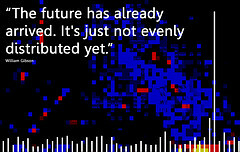 Ultimately, Jeffrey Liker nailed it when he said “Computers move information, people do the work.” Computers and applications will always be able to move and sort data faster than a person – but in the end, people are needed to analyze the resulting information and make decisions. The future of sourcing will see an increased usage of ever-improving semantic search and artificial intelligence candidate matching solutions. Lower-level sourcing roles, such as name generation and searching with basic titles and keywords, will be all but eliminated. Software will be able to do this level of sourcing thousands of times faster than people can, and even more cost effectively than human outsourcing solutions that can currently cost $8 – $15/hour. This is because this level of sourcing is little more than moving data from once place to another (e.g., from the web, Monster, or LinkedIn to an ATS) – there is little to no analysis involved. However, on the other end of the sourcing spectrum, it’s a totally different story. Just as there are currently hundreds of thousands of people who are responsible for having functional and analytical expertise with today’s widely used Financial, HRMS, SCM ERP and BI applications to query and analyze data and information, people within HR, Recruiting and Talent organizations will eventually be required to have highly specialized skills and abilities with regard to leveraging human capital data through the use of semantic search solutions for talent discovery, identification and matching. In the future, the process of creating and automating effective queries of human capital data for talent discovery and identification will be incredibly similar to what a BI analyst currently does when they design data cubes and produce reports from them. Instead of Applicant Tracking Systems, companies will build Talent Warehouses which will become their source of significant competitive advantage with regard to identifying and acquiring top talent. The talent discovery and identification solutions of the future will require people with specialized skills and experience to use them effectively, to customize them for specific business units and ever-evolving hiring needs, and to “teach” and steer matching applications to continually improve them and make them better. Hopefully it won’t take too long for companies to value and invest as heavily in sourcing and recruiting just as they currently do with their multi-million dollar Data Warehousing, Business Intelligence and Decision Support Systems. Investing millions in ERP and BI solutions is great – but what about investing millions into enabling your organization to find, hire and retain the talented, game-changing people who will be using the ERP and BI solutions to analyze your financial, product and sales data and make decisions that can save or make your company millions? What’s more critical and strategic to the sustained and long term success of a company than talent acquisition and retention? As sourcing and matching technology advances, they will require people with the specialized skills and experience to use them, to make sense of the results returned (and not returned!) by them, and to interpret and make decisions based on the data and information provided by them. As will likely always be the case, the value that humans bring to any endeavor is in the ability to do what machines and applications cannot.